Congrats to Natalie Haro and Avery Cross, co-chairs of our Teen Advisory Group(TAG), for being honored as student role models by The Sunrise Rotary Club of Davis. 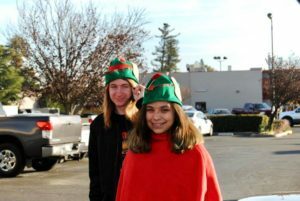 Avery Cross and Natalie Haro, nominated by Da Vinci Charter Academy internship specialist Susan Kirby, who wrote, “Avery Cross and Natalie Haro are both juniors at Da Vinci and both serve as interns at MOSAIC Children’s Museum in Woodland. This new museum that is hoping to open its doors in late 2018 is located in downtown Woodland in the old Western Wear store located at First and Main. “MOSAIC is dedicated to inspiring and empowering children through science, art, imagination, and creativity. Their vision is to be a community resource that teaches young children to learn through their curiosity. “Avery and Natalie have both volunteered since the beginning of the summer and approached me this fall about the possibility of doing this work as an internship. They are learning life skills that they will carry with them. They are also learning real-world business skills and are involved in the ideas and vision for the exhibits and projects at the museum.